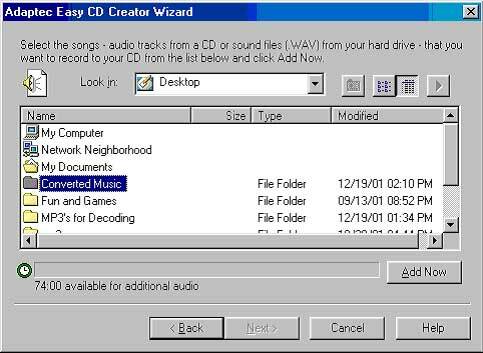 Now that you've created some sounds on your computer, you'll probably want to transfer them into usable media that can be played on your CD, MP3 or tape player. At this point it would be a good idea to make sure that you made your sound file large enough to play for 30-60 minutes, or at least have a collection of several different sounds to equal the same amount of time to get the most out of your recordable CD. If you have already, then the next step is to transfer the media to CD. 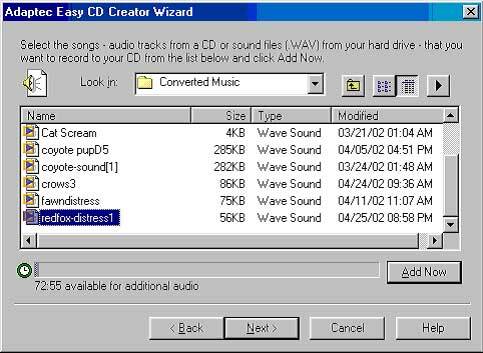 To do this you'll need another program for converting the files into Wave (.wav) format. This process is easily understood and executed. 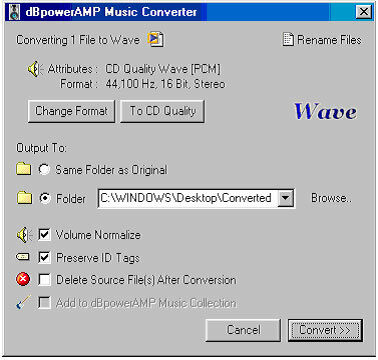 The program I use is as simple as right clicking on the file and selecting Convert, it is called dBpowerAMP and is available for free use from the download sites mentioned earlier in the article, (www.download.com) do a search for dbpoweramp. When the program finishes downloading, find where you saved it and double click its icon to begin installation. After the program is installed it is immediately ready to convert your files. Now go to your folder where you have your files saved and with the RIGHT mouse button click on one of the sounds and select Convert To, as shown below. When you click on Convert To, this will open a small window and will automatically place your mouse cursor on Wave, shown below. If you're sure you won't require the original file taking up space on your computer, you can choose to Delete The Source File(s) After Conversion option. Personally, I keep every sound I have in case I want to use it again in the future, but sound files take up enormous amounts of memory or hard drive space and small clips can add up quickly. Now that you've completed converting your sound files into the desired format, it's time to send them back to a CD, tape or Mp3 player. To transfer them onto a CD you'll need a "Burner" or CDR/W, which is a piece of hardware that is physically installed on your computer. There are no specific instructions for this equipment in this article as each may be different by manufacturer specifications etc. The Burner I use is HP and was on the computer when I bought it. It's what I'll use as a guide for taking you through the process of making your own CD's. Assuming that you have a CD burner and at least one blank recordable CDR, CD Recordable Disc and have made it this far, then the process that seems to have taken so long is about to meet its end. 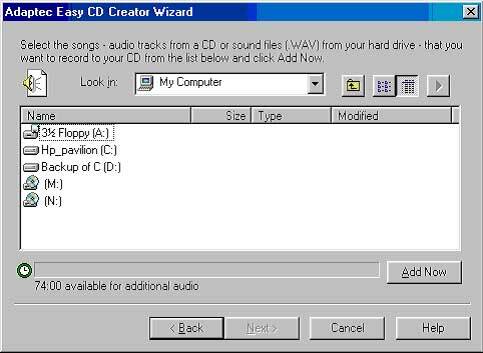 Take your Blank CD and place it in the tray of the CDR/W and close the tray, this should automatically start the required programs for burning your CD. 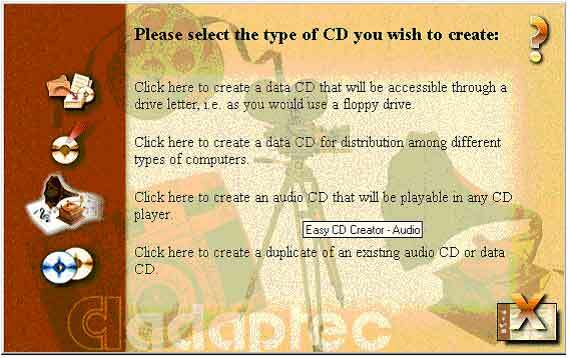 Now follow the on screen instructions as provided by the CD Burner. The opening screen on mine looks like the one pictured below. Since I am creating an audio CD I have selected the appropriate box. And now click "NEXT". When Next is clicked it takes me to the window which asks where my files are stored and which ones I want to select or place on the CD, see below. So direct the program to your sound folder, if you used the default provided by dBpowerAMP, you should click on the folder next to the small window where it says My Computer, by clicking, this takes you up one level, in this case to the Desktop. On the Desktop you will see the folder "Converted Music" listed, double click on that folder, as shown below. 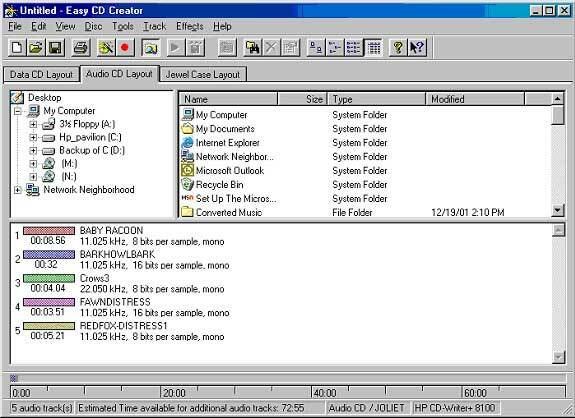 As you select the files the graph at the bottom of the window shows the available time left on the CD for recording. I try to fill this as full as I can get it, in order to get the most from the CD. 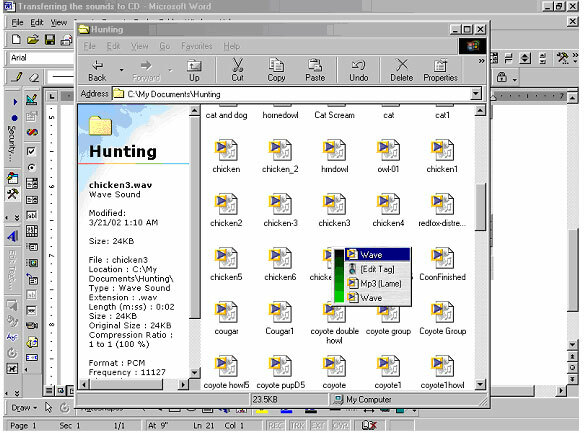 In the background you may also notice your file list being placed in the order in which you chose the files to be placed to the CD. 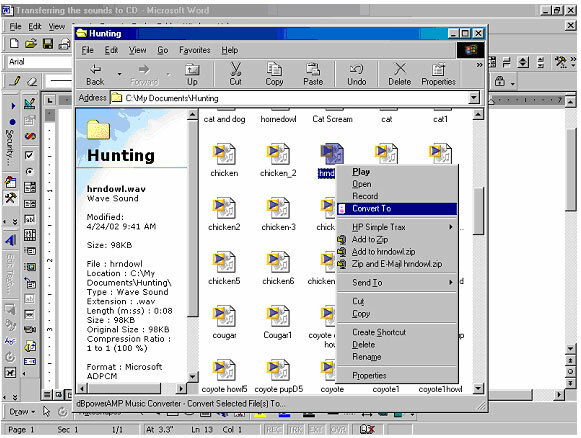 This window also offers all of the above information about your CD to be, including the file names and any other relevant information relating to what you are doing. You can also choose the Jewel Case layout from this window, which is a program for how you want the sounds listed, design for the covers, any labels you may wish to stick to the CD or whatever. I do not use these features as they are only for cosmetic purposes in my opinion, all I do after I finish recording my CD is take a Marks-A-Lot and write on the CD what it contains, since most of mine only contain one or two sounds at the most. 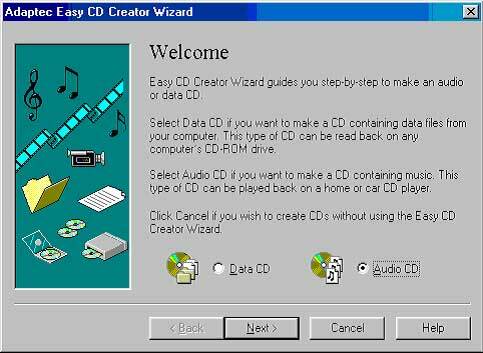 Anyway, getting back on track, this is the final step in creating your CD, and after it "pops out of the oven" you can put it in your CD player and try it out to make sure it works. If you are transferring the sound back to Tape, then go to the next step, otherwise, Good Luck and Happy Calling! !